Maybe you are the kind of person who hugs trees. Or lays a hand upon their hard, wrinkled skin to draw upon the age and weight of them and balance yourself in this uncertain world. Maybe you like to stand cloaked in tree-shadow, and feel like a priestess or secret, half-lost queen, or nameless wild thing. If that's true, you won't think today's post too strange, I hope. I walked amongst trees today and felt as though I was walking through stories. It pulsed silently from their bodies. Trembled from the weathered edges of their leaves. Danced slow, heavy-boned, in the shadows between them. 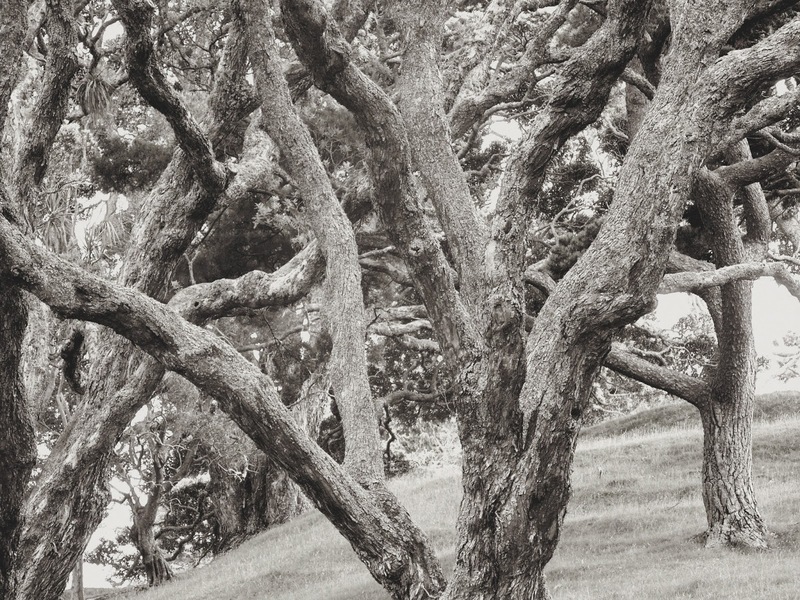 They were stories of wind that bore a spit of western waters, and pohutukawa debris, and the warm musty smell of old suburban streets. Stories of stones underoot, and bird songs, and aches, and the languid caress of the sun between rain showers. The stories seemed so much like my own old memories that I thought the trees were somehow dreaming me, telling me to each other. But story does that, don't you agree? Whether we know what it's about or not, whether we've lived it ourselves or not, story creates sympathy. That's why I think tale-telling is medicine for the soul and infact for the world. It brings us into alignment with ourselves and other living things. Something about the rhythm of it, or the indescribable lure of it, moves us. I need the stories of books, poems, and movies to ground me, restore me, after I've been pulled apart a thousand different ways in this modern world, and to remind me that most people are not so different from me than I would believe. But I also need the stories of the trees, the damp sky, the breeze. They bring me back into sympathy with the natural world which encompasses me. And since I breathe that wind and sky because of those trees, this is deep medicine, vital healing. For a beautiful story which will gather you into sympathy with the winter and the wild around you and within you, read Sharon Blackie's Grey Heron Nights (part one). I love being amongst trees, woodlands are very special and I am always drawn to them; I love the secretiveness and magic that they hold; yet when in a wood I feel that they are friendly and welcome me in.